There is so much to discover in the Lake Wanaka region; a mystic array of mountains, cool glaciers, rivers and lakes and a warm welcome from the passionate people who share your love of paradise. As it approaches winter down in the southern hemisphere, it means that everybody that side of the world is preparing to ski. New Zealand is a popular destination for effortless powder turns. It’s prime months are July, August and September. With ample ski regions, it’s most noted are (in my opinion) down in the Souther Lakes area. 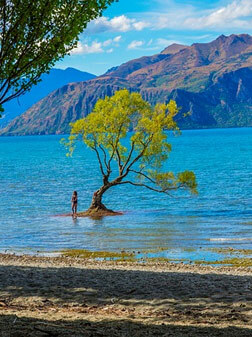 This stretches from the ski towns of Wanaka, Queenstown and five of New Zealand’s finest commercial resorts. None is the same, each have something unique up their sleeve to offer you. Treble Cone: renowned for its steeps and chutes and dazzling powder days Overlooking the stunning Lake Wanaka, it provides a very sizable ski area of around 530 hectares. Not to forget a vertical drop of 700 metres. Wanaka is definitely not a place that takes very long to settle in. When I moved there over a year ago it was still blisteringly hot from the end of summer, the mountains were baron and snowless and I was in a panic trying to find some friends and a place to live. All came rather naturally though, it really is an easy place to start your life over in. Although, I started to pick up on a recurring theme. There is a completely unified appreciation for the outdoors. Everyone is an ‘outdoorsie.’ And why would you defy your mental and physical urges when you live in a place so refreshing. Fantastic whether at both polar ends of the spectrum and the opportunity to climb everything, swim everywhere and ski wherever you bloody well want to as soon as that amazing winter season is upon us. It’s no wonder people refer to it as the world’s first lifestyle reserve. Uncrowded, with beautiful scenery and the absentminded freedom to to whatever the hell you want. And I was quickly surrounded and welcomed by people who understood and appreciated that energy. I quickly found I had time to breathe and take in everything. You change into this carefree, full of life person without even realising. It’s only when I visited home again that it struck me!